Let’s start with junk journal cover. 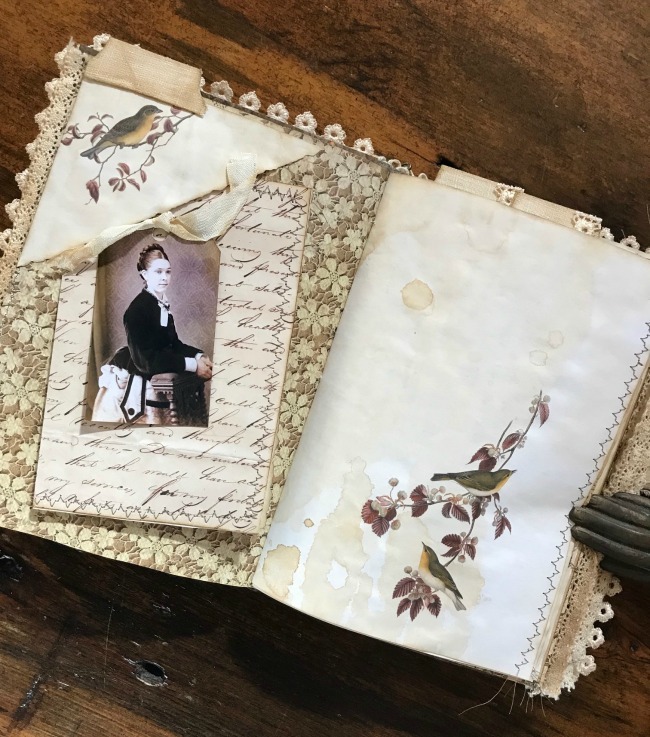 This time I used a vintage book that I covered with some linen that I aged with coffee. 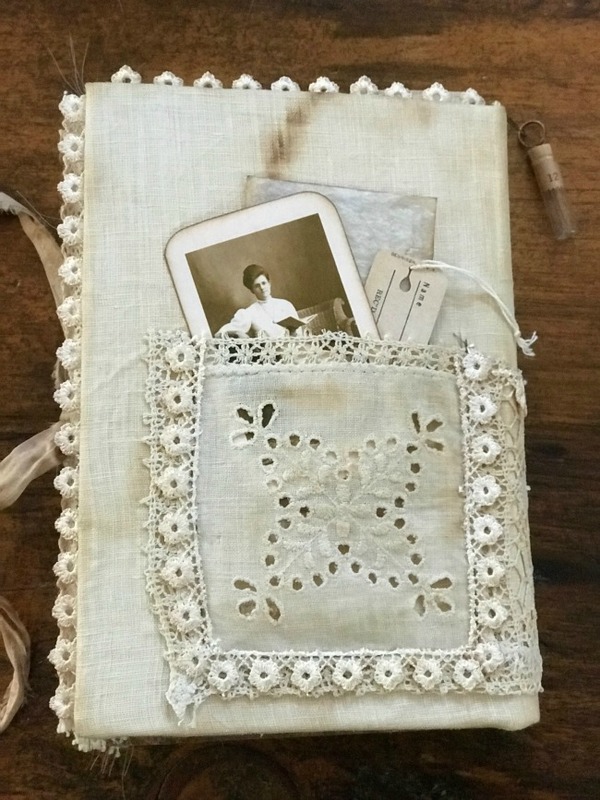 Prior to adhering the linen to the book, I sewed some vintage eyelet lace pockets to the front and back cover. I’ve added a textile collage to the front with the word “Storyteller” stamped in the middle. 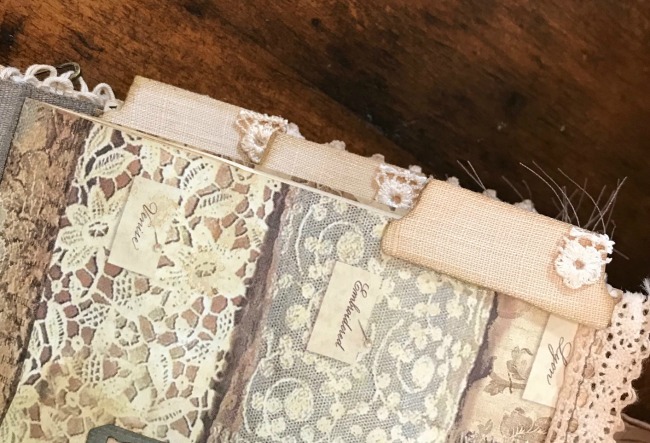 On my journal covers, I always like to incorporate a few antique embellishments. On this one I’ve added antique buttons, an optical lens dangling from a garment pin, and a watch maker’s vial at the spine. The vial contains the original clock parts inside, and from what I can see it looks like two tiny little clock hands. 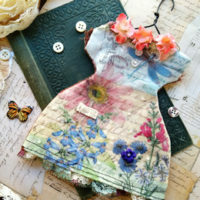 I’ve also added a collectible bird trading card that’s just peeking out of the eyelet lace pocket. Alongside I’ve placed a small file folder with the words “your heart and mine” on the tab. I’ve filled this tiny folder with some lined paper for added journaling space. I just love little rusty safety pins so I had to add one of those too. Moving on to the back cover, you will see in the pocket I tucked away one of TGF’s antique cabinet card photos. This photo was from one of their Antique Portraits Bundles. When I printed this one out I made sure to also print one of their antique Blank Paper Ephemera pages on the reverse side. I like to make sure the back isn’t stark white and is more cohesive with the image on the front. I’ve also taken the time to ink the edges front and back. 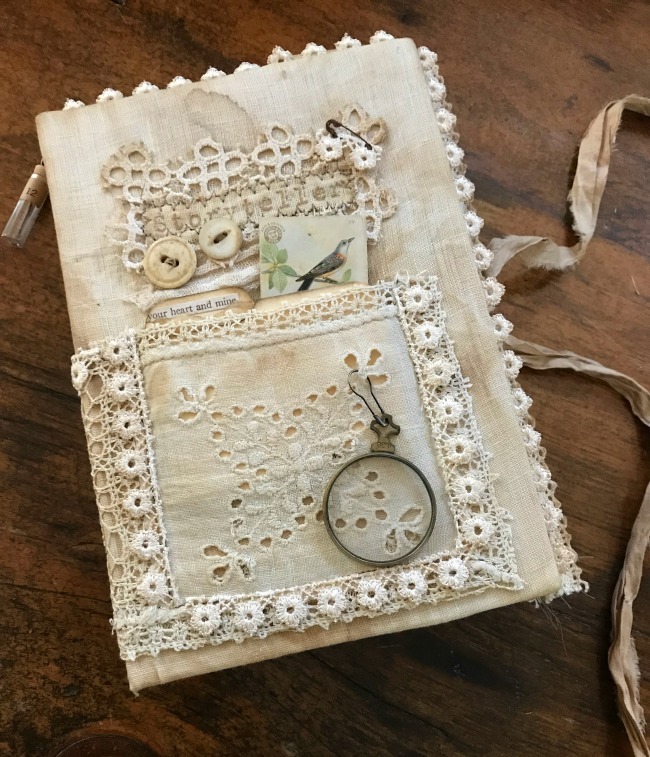 In this pocket, I’ve also added a vintage garment tag and one of my printable love letters from 1862, which I’ve enclosed in an aged glassine envelope. 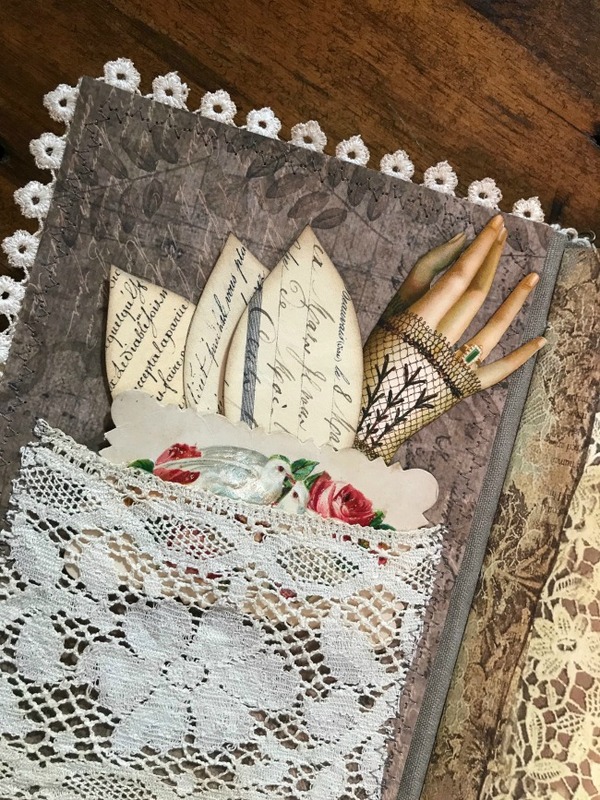 This journal has three signatures with lace along the edges. For the closure, I’ve used a sari silk ribbon. At this point it’s purely decorative, but if the new owner starts adding stuff, it might be necessary to keep it closed. I created a linen tab at the top of the first page of each signature. This makes finding the individual signatures easier. Inside the front and back cover I’ve used a designer cardstock, which I’ve sewed around the outside edge. I added a wide vintage lace for the pockets for additional storage. Inside the front pocket, you will find I tucked away a beautiful lady’s hand. It is a reproduction die-cut from TGF Victorian Valentines Bundle, which I fussy cut out. The lady’s hand was printed out on a matte photo paper, and on the reverse side, I printed again one of TGF’s antique plain ephemera pages. This is a good remedy for making sure the back side of antique images looks as old as the front. Plus, I always ink the front and back edges of these images to complete the antique look. 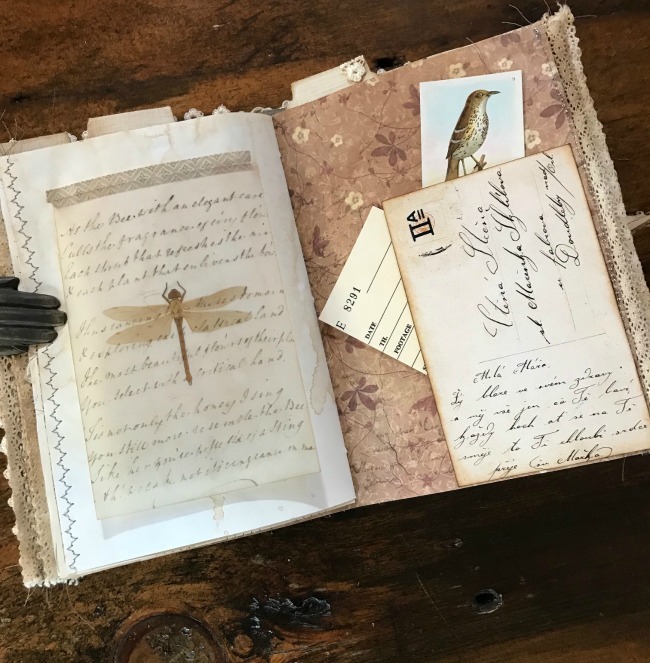 The leaves with antique script make great journaling cards. I’ve added a small paperclip to the bottom so they would fan out and stay together in the pocket. I’ve used images from these bundles as overlays – Birds on Branches bundle, Bohemian Butterflies bundle, and floral In the Garden bundle – all from the Premium Membership site. I think these graphics are a nice contrast to the vanilla aged copy paper. 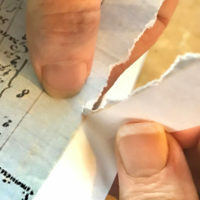 I came up with this technique of aging paper after looking at one of the handwritten cookbooks I’ve had for over 30 years. From all the years of use, it ended up with vanilla stained areas. I loved how it looked, so I decided to give it a try. Using imitation vanilla, which I buy in a gallon jug from a restaurant supply company, is great. I use imitation since real vanilla would be very expensive. Aging with vanilla is a little lighter in color than coffee, and it gives the journal a sweet fragrant smell. Here on this page I used one of TGF’s Script Ephemera bundle pages and layered a dragonfly image from the Woodland Walk bundle over the top. I was lazy this time; I did it the manual way by first printing the script page out and then printing the dragonfly image over the top. I like to use vellum in my journals as a flip up that way you can journal underneath. 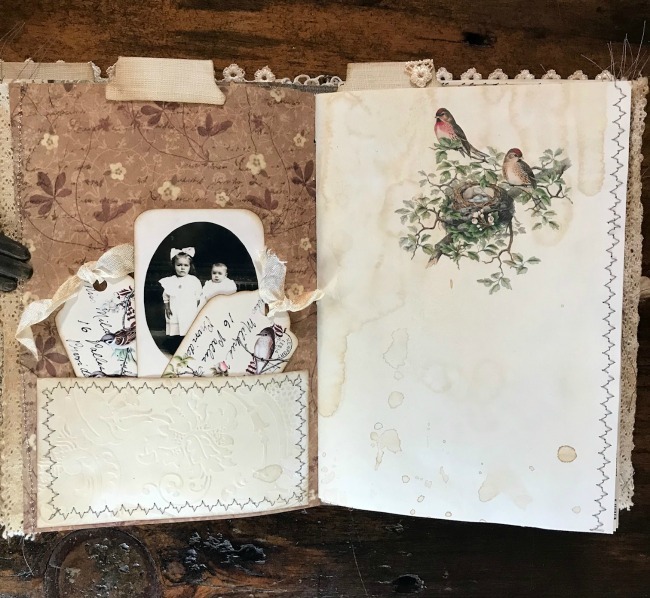 On the opposite page, I used a reprint of a postcard from the Vintage Postcards bundle as a tuck pocket to hold some vintage ephemera pieces. 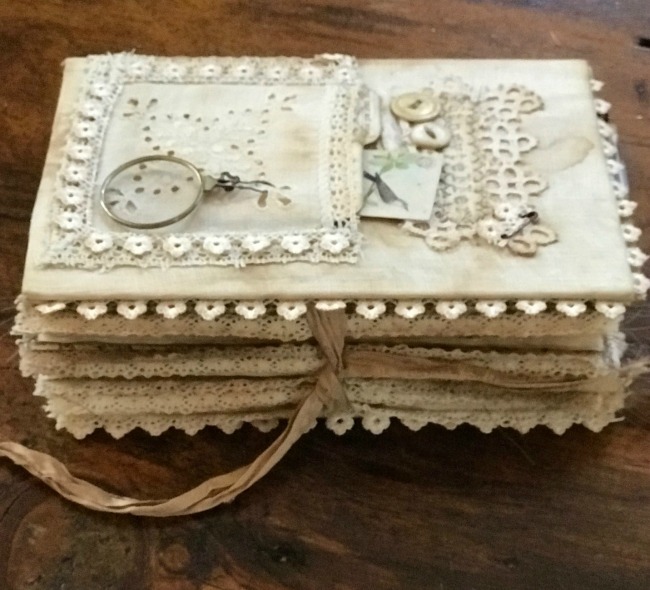 All the Ephemera bundle pieces I added to this journal are from TGF’s Premium Membership site. 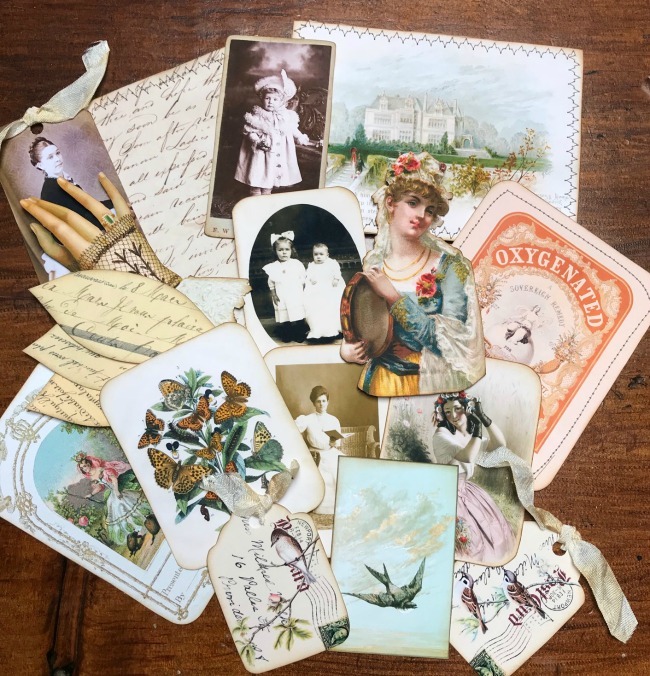 I selected an array of items such as postcards, script pages, botanicals, reproduction die-cuts, and other printable specially designed by TGF for their members. 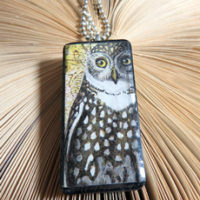 All of these items collectively give this journal its character and beauty. If you haven’t already done so, go check out the flip through video for a more in-depth look at The Storyteller Junk Journal on my YouTube channel. In closing… Thank you so much for checking out my latest journal. I wish you all a safe and happy holiday season! I will be back at the end of next month with another journal to share. If you have any questions you can reach me at the link below, and please feel free to direct message me on Instagram or on Etsy.